News from LMCU: LMCU’s 2014 Bridge Run is in sight! LMCU’s 2014 Bridge Run is in sight! It’s right around the corner! 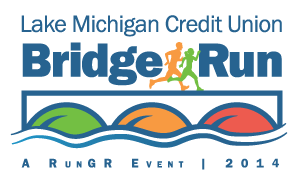 Now in its 13th year, the LMCU Bridge Run is a great way to see how you stack up against other runners, and to promote healthy lifestyles while enjoying the scenic beauty of downtown Grand Rapids. And as a LMCU member, you’re eligible to get a $5 discount on registration fees. Just go to thebridgerun.com, and enter LMCU5 in the promo discount box when you register online. See you there, Sunday, September 14, 2014! Additional race categories for kids and seniors!